MMCC is once again offering a Study Abroad program during Spring Break. 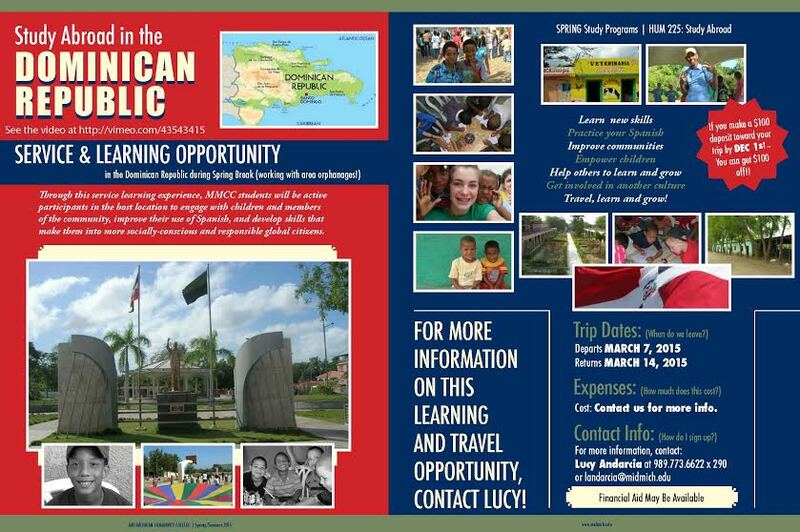 This year’s trip will be to the Dominican Republic from March 7-14. This is a service and learning trip. Students will participate in the local community life by engaging with children and other community members while also practicing Spanish and experiencing a new culture. The trip is planned to be both both fun and rewarding. Students will specifically be working with area orphanages. It is possible that financial aid may be available to help defray the cost of the trip. Students who make a $100 deposit by Dec. 1 will receive $100 off the cost of the trip. Contact Lucy Andarcia at landarcia@midmich.edu or (989) 773-6622, ext. 290, for more information.